I saw Tom Jones on television during the concert that was given for Diana, two weeks ago. He still has the voice, but I didn’t get the goose bumps that I get from some of his 60’s recordings. As a fan of Tom Jones, I also like other artists who sing with the same power, on the top of their voice. Some do it even better than Tom Jones himself, or they sing better songs than Tom Jones recorded. 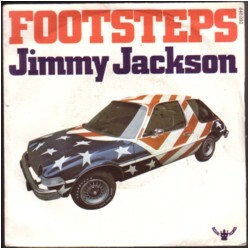 One of the singers in this category is Jimmy Jackson, whose 45 “Footsteps” is one of the most exciting songs I have ever heard. I have played my copy so often that I was very happy to find another copy last week, for only one euro. I will not try to describe the song, you can hear it for yourself here. It has all the ingredients that make music exciting for me: over the top production, a singer that bites off a bit more than he can chew, esoteric lyrics, gimmicks, ugly sleeve, wow, what a record!